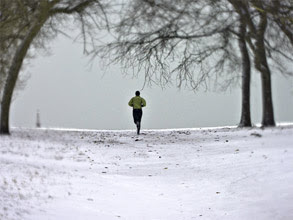 i did not always run in the winter. there was a time that i, like so many others, would follow the patterns of on-season and off-season, and take some respite over the winter. part of it was the belief in recovery time, to let the body, with its accumulated wear and tear and nicks and scrapes and outright injuries and assorted breakdowns, have the chance to recuperate. part of it, too, was the desire for free time, to release the mind from the continual pressures of work and school and home and humanity and let it roam free to grow and find itself in an ever-expanding world. part of it though--and as much as i tried to not think about it--was the need for spiritual time, to reconnect with the more important things in life, things forgotten or misplaced or abandoned or unfinished or never even begun, but whose presence ultimately cannot be denied. the last part was something my grandparents held with deep conviction. given their religious proclivities, it coincided seamlessly with the observance of the Advent season. and in accordance with the strictures of this time for piety and self-reflection, they would gradually shut down all wordly activities of the body and mind and release themselves from the mundane to follow the messages of the spiritual and the sacred. and in the twilights that led into Christmas, they would seek to reconnect with the sublime. i was with them much of this time. being a child, i took their lead, and followed the patterns of their lives. and so in the evenings, after we'd eaten and cleaned and dried and seated and the day had fallen into dusk, we'd gather the wood and start the fire and come together to ponder the mysteries of the twilight, our eyes turning towards the embers in the darkness for the warmth in the hearth and the flickering of the light. and slowly, surely, softly, there would be silence, and then there would be stillness, and then there would be just ourselves, with our souls alone in the depths of the winter night. and it was then that we'd recommit to all that which we held most sacred, and reaffirm our faith in the things most divine, and restate our promises to act upon them so as to make this world--our world--a better place. which was not easy. because we knew that in this world, our world, we weren't just by ourselves. and in the darkness we'd see the sparks that broke off from the flames and then glowed and spun and rose so briefly and then were carried away in the draft to fade into the depths of the darkness stretched so vast above us, and we'd realize who we'd lost. and at those times, i would look at my grandfather, and say: we're so few. so few. and we've lost so many. too many. my grandfather would just gaze at me quietly and repeat to me: i know. i know. and then he would pause, and nod, and finally respond with the same message he had always given every year: we'll close ranks, and we'll reform the lines, and we'll guard the fire for one more night, so that there may be just one more day. for years, i lived by those words and kept to those promises and held to the calling of the seasons. 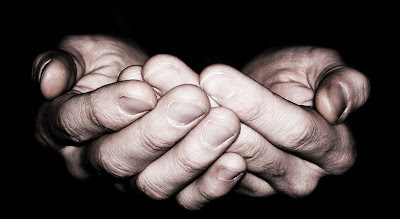 for the sake of the spirit, for the sake of this world, for the sake of all souls. but then, one Advent, in the years long after my grandfather's passing, and near the end of my grandmother's time, she and i were seated alone together late one Christmas Eve recounting all the fires of all the seasons before, and in midst of our reveries and in the stillness of the evening she came upon a revelation that glowed like the coming of a great multitude of stars long lost but rediscovered to bring their lights once more to all the spirits caught forlorn within the abyss...and their message blazed greater than all the minions of all the darkness of all the void. and at that moment, she paused, and then she came out from within her shadows and then she looked at me and then she sighed and then she began to cry. and then she spoke, in tears that held back the silence that heralded the coming of all our eternities: the fire wasn't meant to stay in one place, you know, it wasn't meant to be hidden. it was meant to be seen. it has to be seen. if anyone is going to find it, it has to be seen. and at that point, she realized what it was going to lead her to say, and she broke down and wept with what came next: and that's why i'm going to let you go. because i know i have to let you go. you're the little bird who's been in the nest, and now it's time for you to fly away...the fire goes with you. i didn't know it, but that was the last time we would ever talk like that again. in the years since, i've thought a lot about that moment, i've thought a lot about what she said. it's haunted me. it haunts me still. for my part, i've done my best to incorporate it into my life. not because she asked, but because i know she was right. i stopped following the seasons. i stopped taking the winter respite. i stopped with the Advent and Christmas break. now, instead, i run. i run all the time. especially all the time. but that does not mean i have forsaken the things my grandparents taught me. if anything, i've taken them even more to heart. because you see, i've come to believe--i've come to know--that the important things, the sacred things, are not just about what we believe or commit or affirm or act, but about what we live and how we do so. and so now when i run, i run not just for the building of the body, but also for the freedom of the mind and the transfiguration of the spirit. now when i run, i run towards greater truths. and those truths require my entire being; they require all of me. 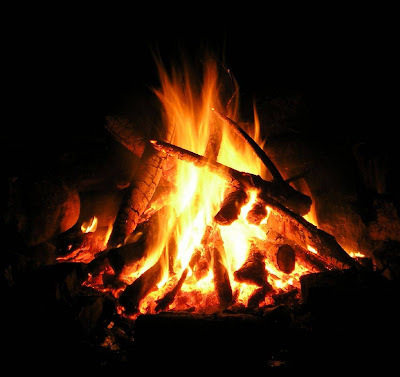 because the fire isn't meant to burn for just a night or a day nor for a winter or a season. the fire--creation's fire, the sacred fire, our fire--was meant to burn forever. like the coming of a great multitude of stars long lost but rediscovered to bring their lights once more to all the spirits caught forlorn within the abyss...with a message that blazes greater than all the minions of all the darkness of all the void. and that message is eternity. we like to think of ourselves as being good, as being embodiments of qualities we think are associated with our names: compassionate. courteous. kind. courageous. pious. virtuous. even noble. things that represent our greater ideals, and which we think will make a better world. but invariably in the course of daily living our lives end up becoming something else. we succumb to the afflictions of our lesser realities, and lose ourselves in the mundane details and perpetual travails of society and the world, and find ourselves pushing things away and postponing promises and shuffling priorities and changing choices and making decisions that we swore we would never make and thinking and saying and doing things we thought we would never think or say or do...and in so doing, despite our aspirations to the contrary, we inevitably add to the suffering in this world. and then, perhaps out of denial, perhaps out of guilt, perhaps out of frustration, perhaps out of regret, perhaps out of fear, we tell ourselves that it's okay. we tell ourselves that the race is long, that there's always time, that there's the rest of our lives, and that there's always a future to make things right. thing is, we know that's not true. because we know, as every creature that has ever realized the nature of their mortality has ever known, that every race has an end. that there isn't always time. that there's not the rest of our lives. and that there is not always a future to make things right. because we know, as every creature endowed with the gift of life has ever known, that a race cannot be changed once it has been run. whatever happened is what happened. whatever we thought is what we thought. whatever we said is what we said. whatever we did is what we did. and none of it--none of it--can be undone. which is why we must ask ourselves about our legacies. about what it is that we really want associated with our names. because if we want our names to be associated with greater ideals instead of lesser realities, then we must recognize that the race is not just about reaching the end but also about what happened on the way. that race is not about when we finish, or if we finish, but how. because our end, above all things granted to us in this life, is without any doubt most certainly assured. it's the nature of our lives that is not. and if our lives are to be about our greater ideals, if our lives are to be about helping to make a better world, then we have to act to confront our lesser realities, and we have to act to ease the suffering in this world. not later, not tomorrow, not at the end of our race, but now. while the race is still being run, while there is still time, while there is still life, for ourselves and for this world, so that both can truly become good. our legacies originate from our nows, even as they reside in our futures. 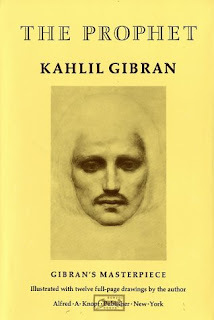 i wanted to highlight one of my favorite poets: kahlil gibran. he's a bit of an enigmatic figure in literature, with much less attention given to him and much less information known about him compared to other poets and writers i've mentioned here. as a result, i can't say that i like him as an artist, since there's just not that much available to understand him, but i do like him for just one very special, very unique, very profound piece of his: the prophet. i've read his other stuff, and it didn't move me the same way. the prophet is just one of those works of literature that surprises you, but in a way that is very quiet, very soft, very gentle, to the point that it seeps slowly into the deepest recesses of your mind and then lingers like a long lost memory of sublime beauty that rises to something sacred, and which you can thus never quite bring yourself to let go away--nor would ever want to. it is, in a word, exquisite. i will state why the prophet means so much to me. 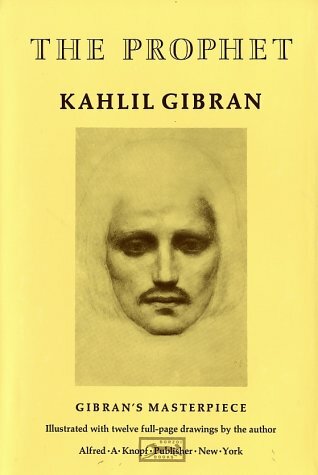 kahlil gibran, at least as much is known about him, exudes a sense of ineffable loneliness. and you can feel that sense, and the emptiness that it brings to life and living, in the prophet. but more importantly, you find gibran's response. the setting of the poem is a city, wherein the namesake prophet has been informed a long-awaited ship has arrived to take him home. when the word of his departure spreads throughout the city, the populace cries out in sorrow, for they have come to rely on the prophet as the source of wisdom and comfort in their lives. in a last effort to glean their final lessons from him, they begin to ply him with questions on a range of subjects, including children, love, aging--essentially, the essence of living. the poem consists of chapters, with each chapter being the people asking questions, and the prophet then giving his answers. in the course of discussing the issue of living, i find that the poem gets to one of the most incredible mysteries of life: substance. for so many people, at so many times, the act of living becomes an act of emptiness. we go through our days going through the motions, with nothing in terms of spirit. there is, as has been said in many other ways, no purpose, no urgency, no vitality, no connection with the notion of life in a universe that has absolutely no reason to have it. the french use the phrase joie de vivre (i.e., joy of living), but in the sense of joy being the ecstasy that comes from understanding--the joy that comes from fulfillment of knowing all that there is to know...and so often we lose it. and in so doing, lose ourselves. and that's when we're most alone. gibran's passages respond to this. the prophet speaks of the things that fill the emptiness, not just in actions or goals or concepts or things, but in terms of perspectives on how to see and understand and approach and embrace the mystery of living in a way that does justice to the sanctity of life. in short, it gets to spirit. it gets to purpose. it gets to substance. and i speak of this from experience. because in the times of my emptiness, in the times when i am lost, in the times when i am most alone, the prophet has been one of the few things that has ever brought me back.